PYA (Pershing Yoakley & Associates), a national management consulting and accounting firm, has released a new white paper detailing the requirements of the new Medicare Merit-Based Incentive Payment System (MIPS) in a straightforward, easy-to-follow format. 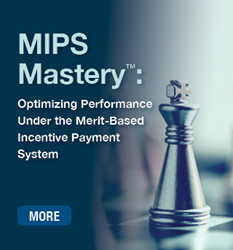 A new white paper from PYA, “MIPS Mastery™: Optimizing Performance Under the Merit-Based Incentive Payment System ,” provides a thorough explanation of the MIPS program and highlights the strategic decisions providers face in maximizing their performance under this new value-based reimbursement program. The first MIPS performance period starts on January 1, 2017. A physician’s (or non-physician practitioner’s) scores, measured in four categories—quality, resource use, advancing care information, and clinical practice improvement activities, will determine his or her composite performance score, expressed as a number from 1 to 100. In addition to impacting a provider’s Medicare payments, beginning in 2019, this score will be publicly reported, affecting the provider’s reputation among payers, patients, and other providers. PYA’s MIPS Mastery™ program cuts through the regulatory complexity to bring a common-sense approach to the MIPS challenge. MIPS Mastery™ is a facet of PYA’s Population Health Ascend suite of products designed to assist providers in the transition to value-based reimbursement. PYA’s seasoned team of professionals delivers MIPS Mastery™ program content in an engaging manner, tailors engagements to organizations’ specific needs, and utilizes both an in-depth understanding of practice operations and a focused approach to data analytics to help optimize performance. For over three decades, PYA (Pershing Yoakley & Associates, P.C. ), a national healthcare consulting firm, has helped clients navigate and derive value amid complex challenges related to regulatory compliance, mergers and acquisitions, governance, business valuations and fair market value assessments, multi-unit business and clinical integrations, best practices, tax and assurance, business analysis, and operations optimization. PYA’s steadfast commitment to an unwavering client-centric culture has served the firm’s clients well. PYA is now ranked by Modern Healthcare as the nation’s 9th largest privately owned healthcare consulting firm. PYA affiliate companies offer clients world-class data analytics, professional real estate development and advisory resources for healthcare providers, comprehensive claims audits for self-insured Fortune 500 companies, wealth management and retirement plan administration, and business transitions consulting. For more information, please visit http://www.pyapc.com.